Dress in a black and white horizontal striped tank dress if you're on the hunt for an outfit idea for when you want to look casually cool. Kick up the cool of your look by complementing it with Soludos jason polan espadrille sandal from Nordstrom. We all ensemble for comfort when it comes to dressing up, and this combination of a black print tank and a white skater skirt is a great illustration of that. 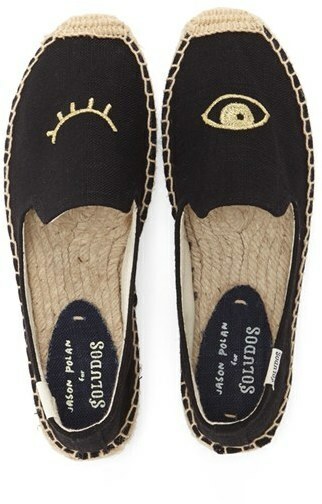 When it comes to shoes, this ensemble is complemented wonderfully with Soludos jason polan espadrille sandal. If you're on a mission for a casual yet chic outfit, consider pairing a beige anorak with white skinny jeans. Both garments are totally comfy and will look fabulous together. When it comes to shoes, this look is complemented nicely with Soludos jason polan espadrille sandal from Nordstrom. If you're in search of a casual yet totally stylish look, make a light blue blazer and a black button skirt your outfit choice. Both items are totally comfy and will look fabulous together. For something more on the daring side to complement this outfit, grab a pair of Soludos jason polan espadrille sandal. Consider wearing a black silk tank and blue ripped skinny jeans, if you want to dress for comfort without looking like a slob. When it comes to shoes, this getup pairs wonderfully with Soludos jason polan espadrille sandal. If you don't like getting too predictable with your looks, go for a white floral swing dress. 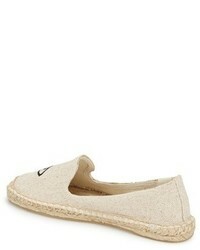 Break up your ensemble with more casual shoes, like this pair of Soludos jason polan espadrille sandal from Nordstrom.